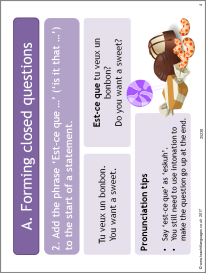 A clear overview of different ways to form questions in French, with pair work practice for each method. Matching and Snap interactive games will help students recall question words and could be used as starter or plenary activities. Logical explanation and lots of practice provided. A great resource!